Symphonic Wind Ensemble is the top concert ensemble at Blue Valley West, made up of about 45 of the top band students. They perform only the best music written for wind ensemble. SWE meets 1st block both semesters. Membership is determined through an audition process in May for the following year. Symphonic Band is the second concert ensemble at West, comprising about 55 students. They play traditional concert and symphonic band works at a high level. Symphonic Band meets 7th block both semesters. Membership is determined through an audition process in May for the following year. Concert Band is the third concert ensemble at West. They play traditional and symphonic band works while working on fundamental instrument skills. They meet 6th block both semesters. Membership is determined through an audition process in May. Jazz Ensemble classes rehearse at West during the school day. Jazz Ensemble I is the premier jazz band at West. They play the best jazz music in a variety of genres - big band, swing, funk, modern, and more. Membership for each group is determined through an audition process depending on enrollment. Jazz Ensemble I meets during 4th block year-round. Jazz Ensemble II meets during 2nd block year-round. Lab Jazz Band is the third (and fourth, most years) jazz band at West. Membership is open to any student who is interested in learning how to play jazz. The music focuses on developing basic jazz technique and improvisation. This is a large jazz ensemble, and many students play secondary instruments. This band meets after school on Tuesdays and Thursdays starting in November and is led by senior students from both curricular Jazz Ensembles. 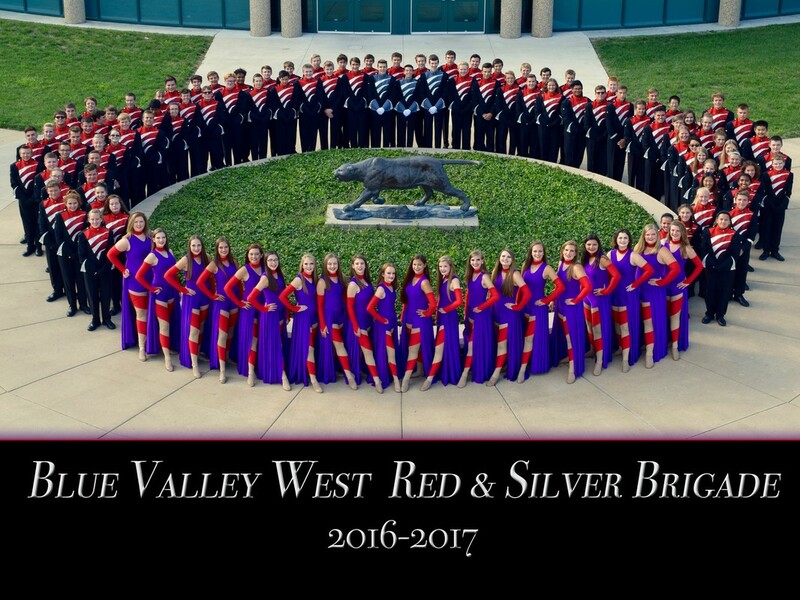 The Spirit of Blue Valley West is the traditional marching band at BVW. All students enrolled in a band class perform in this band at football games, pep rallies, and parades. The Spirit of Blue Valley West performs pregame and a traditional-style halftime show at home football games in addition to playing in the stands. All rehearsals (except for pre-football game rehearsals) are during the students' concert ensemble class - ​no outside rehearsal time. The Blue Valley West Competitive Marching Band is extra-curricular "varsity sport" of the band program. They work hard over the course of their season to learn, perfect, and perform a high-quality show. They perform at local festivals, and at least one BOA Super Regional competition each fall. Membership is auditioned in all sections during April and May of the previous school year. Saturdays: A Saturday rehearsal in August and September each, plus competition weekends in September and October.